A video of an impressive demonstration of Boeing's latest MAX series plane lifting off the ground at a near 90-degree has been shared on Youtube and across the world. A new video posted to Youtube by aircraft manufacturing company Boeing this week has been making headlines around the world. This footage captures the incredible and almost impossible near-vertical takeoff of the firm's latest 737 plane at the Farnborough International Airshow. The clip was taken on the third day of the airshow during a demonstration for the new Boeing 737 MAX 7. According to Boeing, the agile airplane is the third and most recent member of its popular and efficient Boeing's 737 MAX series. The Hampshire-based airshow is known for showcasing the most-advanced innovations and technology in the aerospace industry. Still, the sight of the near-vertical plane succeeded in impressing the exhibition's seasoned audience. In the video of this incredible feat, the Boeing plane can be seen rushing down the runway and then almost seamlessly performing a near 90-degree takeoff. The aircraft speeds into the blue cloudy sky with its nose pointed upward. According to Boeing, the newly-introduced craft was specifically designed for exceptional performance including the capacity to fly out of airports at high altitudes and thrive in hot climates. "The MAX 7 will provide airlines an efficient product for opening and flying thinner markets and accessing challenging airports, while enjoying all the benefits of being part of the 737 MAX family," said in a statement Randy Tinseth, vice president of Marketing, Boeing Commercial Airplanes. The improved Boeing craft boasts the longest range of any MAX family model allowing it to reach 3,850 nautical miles. The plane also has an increased passenger capacity of 172 with an efficient 18% lower fuel cost per seat. The 737 MAX series is already the firm's fastest-selling craft family in history. So far, the company has sold over 4,300 737 MAX models to 93 customers around the world. In fact, this latest model is the third 737 MAX family member revealed by Boeing in just the last three years, a testament to the series' popularity. In addition, MAX 7's incredible Farnborough takeoff is not the model's first flight achievement. The aircraft successfully completed its first flight tests back in March 2018. 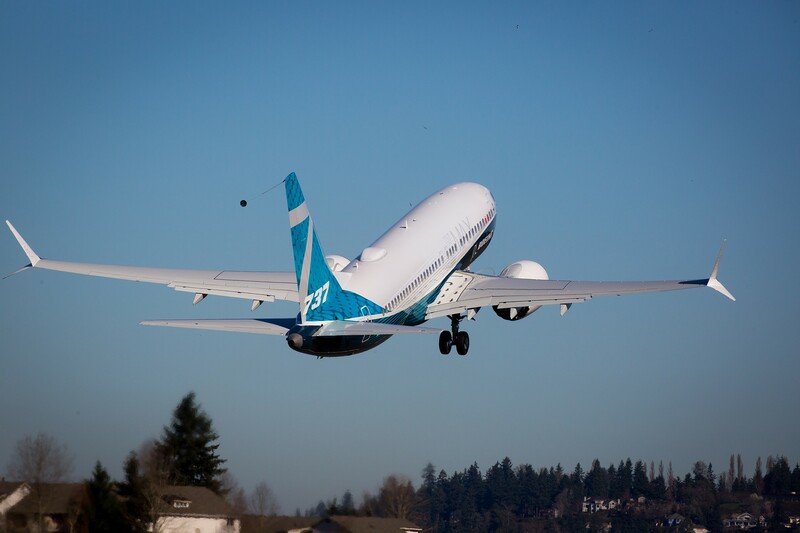 "Everything we saw during today's flight shows that the MAX 7 is performing exactly as designed," had said Keith Leverkuhn, vice president and general manager of the 737 MAX program, Boeing Commercial Airplanes. The series is set to complete certification and begin delivery in 2019. Its amazing performance at this year's airshow may see the new line be the most popular yet. The Farnborough airshow, organized by Farnborough International Limited, is a week-long biennial event that brings together the aerospace and defense industries' biggest players. In previous years, it has registered more than 200,000 visitors.